EluneVision sells screens directly to American customers. To obtain a quote for our Reference Studio or Reference Studio AudioWeave screens, look through the below tables, and let us know what type, size and features you want via the form at the bottom of the page. We will call you back within 24 hours with a price for the screen you specified. 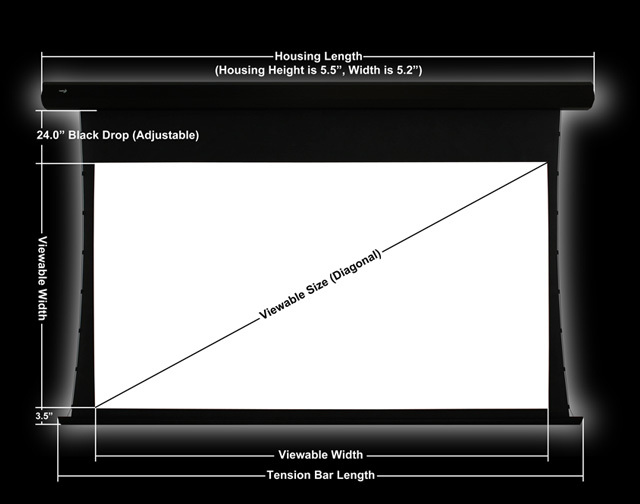 We have standard screen sizes listed below, but feel free to let us know if you would like a custom Reference Studio screen size, which we have not listed below, built for you. Currently, the lead time for screens, from the date of payment to the date you receive the screen, is typically between 1 to 4 weeks, depending on customization. 1 16:9 Reference Studio 4K 39.3" 69.8" 80"
2 16:9 Reference Studio 4K 45.1" 80.2" 92"
3 16:9 Reference Studio 4K 49" 87.2" 100"
4 16:9 Reference Studio 4K 52.9" 94.1" 108"
5 16:9 Reference Studio 4K 56.4" 100.2" 115"
6 16:9 Reference Studio 4K 61.3" 108.9" 125"
7 16:9 Reference Studio 4K 66.2" 117.6" 135"
8 16:9 Reference Studio 4K 73.5" 130.7" 150"
9 16:9 Reference Studio 4K 80.9" 143.8" 165"
10 16:9 Reference Studio 4K 88.2" 156.8" 180"
1 16:9 Reference Studio 4K 45.1" 80.2" 100" 94" 92"
2 16:9 Reference Studio 4K 49" 87.2" 109" 105" 100"
3 16:9 Reference Studio 4K 52" 92.4" 114" 110" 106"
4 16:9 Reference Studio 4K 54.9" 97.6" 119" 115" 112"
5 16:9 Reference Studio 4K 58.8" 104.6" 126" 123" 120"
6 16:9 Reference Studio 4K 66.2" 117.6" 140" 137" 135"
7 16:9 Reference Studio 4K 73.5" 130.7" 153" 150" 150"
1 16:9 Reference Studio AudioWeave 4K 39.3" 69.8" 80"
2 16:9 Reference Studio AudioWeave 4K 45.1" 80.2" 92"
3 16:9 Reference Studio AudioWeave 4K 49" 87.2" 100"
4 16:9 Reference Studio AudioWeave 4K 52.9" 94.1" 108"
5 16:9 Reference Studio AudioWeave 4K 56.4" 100.2" 115"
6 16:9 Reference Studio AudioWeave 4K 61.3" 108.9" 125"
7 16:9 Reference Studio AudioWeave 4K 66.2" 117.6" 135"
8 16:9 Reference Studio AudioWeave 4K 73.5" 130.7" 150"
9 16:9 Reference Studio AudioWeave 4K 80.9" 143.8" 165"
10 16:9 Reference Studio AudioWeave 4K 88.2" 156.8" 180"
1 16:9 Reference Studio AudioWeave 4K 45.1" 80.2" 100" 94" 92"
2 16:9 Reference Studio AudioWeave 4K 49" 87.2" 109" 105" 100"
3 16:9 Reference Studio AudioWeave 4K 52" 92.4" 114" 110" 106"
4 16:9 Reference Studio AudioWeave 4K 54.9" 97.6" 119" 115" 112"
5 16:9 Reference Studio AudioWeave 4K 58.8" 104.6" 126" 123" 120"
6 16:9 Reference Studio AudioWeave 4K 66.2" 117.6" 140" 137" 135"
7 16:9 Reference Studio AudioWeave 4K 73.5" 130.7" 153" 150" 150"